On the side of Mt. 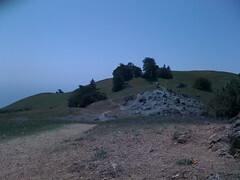 Tamalpais in in the summer. Mt. Tamalpais sits across the San Francisco bay from me, on a clear day you can even see it from the hills behind the Berkeley campus. 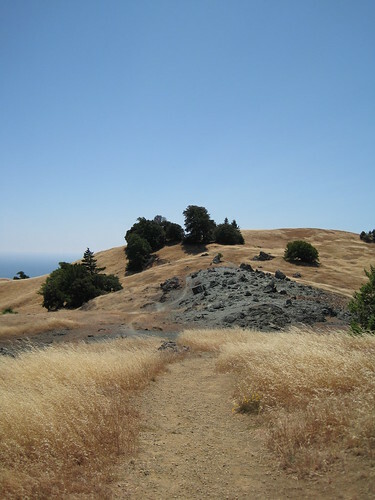 Apparently, the region around Tamalpais is also home to species, especially plant species, found no where else. These local species are threatened by other, invasive, species that have been brought to northern California from all over the world. Some accidentally, but many more imported as ornamental species for private gardens. Invasive species aren’t something I worry a lot about, but we had a great presentation in one of my classes on Tuesday by a woman who’d spent several years fighting the good fight against them across the bay. Take French Broom, a woody shrub from the Mediterranean. California’s native habitat is quite similar to the Mediterranean climate and the species is thriving, growing so densely that it chokes out tree seedling before they can grow big enough to escape the thicket. The plant is out-competing FORESTS! And it’s also taking a bite out of the ecological niche currently occupied by alpine grasslands like the one pictured. The answer, it turns out, it not us, and not the native plants. So we’re losing the war to protect native species. The people fighting against the invading plants are too few in number and limited by lack of resources. What does the public do? They get upset and convince one of the major organizations trying to protect the local ecosystems (The Marin Municipal Water District) to abandon the use of herbicides. The MMWD manages over 21,000 acres of land around Mt. Tamalpais. (Having enough water is a big issue in our part of California.) Simply monitoring that much land (little of it flat) for invasive species is a herculean task. But it is not enough to find the invasive species, if they aren’t removed they will produce seeds than can spread across the entire region. * So how do they get rid of the plants? Have you ever tried digging dandylions out of a front lawn? 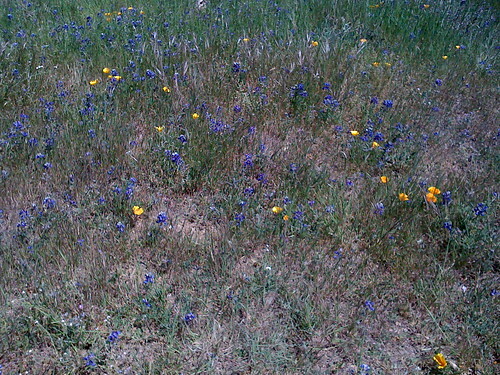 They’re little yellow flowers that break up the uniformity of a lawn and are considered undesirable. It’s hard work and you have to careful with each one, because they have a big central root, and if it breaks off when you try to pull the plant out, the root will just send up a new shoot. A law is tiny on the scale of ecosystems, perhaps a tenth of an acre. The MMWD faces an area two-hundred-thousand times as big, infested with invasive plants tougher and more resilient than minor weeds like the dandylion. Before the push to remove herbicides from their ecological management toolkit the MMWD had four tactics to use against invasive species. Now they are left with three. Hand removal: 20-somethings just out of college and dedicated to making a difference out in the fields digging or pulling up invasive plants one at a time. Good: it’s specific, only targets the species we want to get rid of. The Bad: It’s long hard work. There aren’t nearly enough people to turn the tide. And it probably burns out a lot of enthusastic young people who otherwise might have gone on to do more for the environment. Mechanical Removal: Plows and roto-tillers breaking up the soil and destroying everything in their path. (Or just mowing, which as anyone who has ever had a long knows, is a best a VERY temporary solution) The Good: Can cover a lot more ground in less time than hand removal. Maybe more effective at destroying the root systems of plants (both invasive and native) than hand removal. The Bad: Kills all the plants, not just invasive ones. Leaves soil much more vulnerable to erosion. Hard to get the machinery to less accessable locations. Burning: Walking through fields with an improvised flame thrower. Good: Can target specific plants. Faster than hand removal. Bad: Barely touches the root systems. Only an option for part of the year (I presume they can’t use fire controls during the dry season which seems to be most of the time these days). All the usual risks of mixing exhausted young people and fire. The reason people use herbicides in the first place is because there are no better options. In the local fight against invasive species herbicides were used only after a bunch of conditions were satisfied (read more here), and only three herbicides listed as “least toxic” based on a integrated pest management strategy were used, Round-Up being one of them. The choice has apparently been made that not even protecting native species, and ecosystems we all enjoy (forests and gasslands), is sufficient justification for the use of a handful of the least toxic herbicides. In the case of round-up’s active ingredient (glphyposate), it breaks down quickly in the soil so it can’t build up in the environment, and has a mode of action (the way it kills things) that is specific to plants. Animals don’t even have the biochemical pathways that the herbicide effects in plants. On pesticides in general, my view is and continues to be that we should work to minimize their use when we have viable alternatives, and when they must be used, choose the ones with the fewest environmental side effects (ones that breakdown faster and effect fewer non-target forms of life). But there are times when the alternatives would cause more harm than the pesticides. The environment has being harmed long before the first synthetic pesticide was created. A huge amount of damage can be, and has been, done with nothing more sophisticated than a steel plow blade or a herd of goats. Standing on principle to refuse to use our own technology to control a problem we created. French broom is still sold as a hardly, draught-tolerant plant that will look great in your garden. *One of the things that can make a species more successful at being invasive is producing lots of little seeds that can travel long distances. A single plant can give rise to hundreds, or even thousands more scatered over square miles.